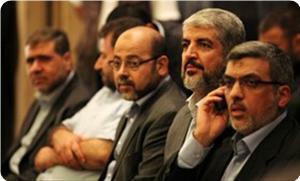 CAIRO, (PIC)-- A senior Hamas delegation led by its supreme leader Khaled Mishaal has discussed three important topics with the Egyptian intelligence chief Murad Muwafi in Cairo on Saturday. Political bureau member of Hamas and member of its delegation Sami Khater told the PIC that the first issue was that of the Palestinian prisoners who have gone on hunger strike in Israeli jails to protest harsh incarceration conditions. He said that the issue was met with understanding on the part of the intelligence chief. Khater said that the second issue was that of national reconciliation, since Egypt was patronizing that file, and affirmed his movement’s keenness on following up and completing that issue successfully. The reconstruction of Gaza was the third discussed topic including importance of expediting its implementation, the Hamas leader said. The PIC reporter in Cairo earlier said that the delegation led by Mishaal also included his deputy Dr. Mousa Abu Marzouk, and political bureau members Khater, Saleh Al-Arouri, and Khalil Al-Haya. The delegation arrived in Cairo on Friday night. ISLAMABAD: After a five-month impasse, Pakistan and the United States resumed formal talks on Thursday as Washington’s point man on Pakistan and Afghanistan arrived amid efforts to mend fractured relations. However, the two sides appeared to have made little headway on some of the key stumbling blocks preventing full resumption of bilateral ties. Marc Grossman, the US special representative for Afghanistan and Pakistan, held talks with senior Pakistani civil and military officials on Thursday during his first visit to the country since a parliamentary review was ordered in the wake of the air strike. Grossman held formal talks with Foreign Minister Hina Rabbani Khar, who was assisted by Foreign Secretary Jalil Abbas Jilani and other senior officials. The US envoy also held a crucial meeting with army chief General Ashfaq Parvez Kayani in Rawalpindi as part of efforts to repair damaged ties due to last year’s Nato air strikes that killed 24 Pakistani soldiers. The logjam was made even more apparent at a joint news conference addressed by Marc Grossman and Foreign Secretary Jalil Abbas Jilani. “We consider drones as illegal, non-productive and accordingly unacceptable,” Jilani told reporters. “This is an issue which also has been discussed at the highest civilian and military leadership,” he said, adding that Pakistan expected talks with US officials to lead to a solution under the guidelines set by parliament. Meanwhile, even though Grossman offered condolences for the Nato airstrikes, he stopped short of an apology, and on the drone issue said both Pakistan and the US faced threats from al Qaeda and other extremist groups. “Efforts will be made that such incidents do not happen in the future as both Pakistan and the United States are partners in the war against terror and they have common enemy and need common strategy to fight this menace,” Grossman said. But the Obama administration has so far showed no signs of compromising its CIA-piloted drone campaign in the tribal regions. A foreign office official, requesting anonymity, told The Express Tribune that the two sides had a ‘candid and frank discussion’ but deadlock persisted over a US public apology for the Nato airstrikes and drone attacks inside the country’s tribal belt. The two sides also discussed the possibility of resuming Nato supply lines suspended since the Salala incident. Grossman said the US was ready for talks on re-opening the supply lines and clearing outstanding payments to Pakistan to meet the expenses of military operations in its tribal areas to fight Taliban and al Qaeda militants. “We are ready to get to the work. We want to work to reopen the ground lines of communication. We want to discuss several outstanding claims for the coalition support fund (CSF),” Grossman said. Grossman said the United Stated wanted to increase market access and economic opportunity and wanted a stable Pakistan and Afghanistan. However, Jilani said a new arrangement would need to be worked out. Grossman will be in Islamabad until today (Friday) and is due to meet other civilian leaders, including President Asif Zardari and Prime Minister Yousaf Raza Gilani in an effort to break the stalemate. He will also participate in a trilateral meeting between Pakistan, Afghanistan and the US on the Afghan reconciliation process. A milestone in international justice also highlights the Court’s need to maintain its legitimacy. After a long and expensive trial, the Special Court for Sierra Leone will finally give its verdict on whether former Liberian president Charles Taylor is guilty or innocent of war crimes and crimes against humanity. While there is little doubt Taylor commanded militias that were responsible for some horrific acts of violence in his home country, Liberia, today’s judgment will consider the extent to which he should be held responsible for ordering and condoning various war crimes (including murder, sexual violence, and enslavement) committed in neighbouring Sierra Leone. Amongst Western governments and their publics, there is widespread agreement that prosecuting Taylor has been the right and proper thing to do. The West considers the Special Court of Sierra Leone as upholding human rights and bringing justice to bear on a brutal dictator. Yet even though these claims undoubtedly have merit, it would be naïve to think that international justice is being pursued purely for its own sake. It seems particularly important to acknowledge that justice, especially international justice in the context of war crimes, can never be completely isolated from its broader social and political context – no matter how hard we try to separate the two. The prosecution of Charles Taylor is no exception. Those who are cynical about prosecuting war crimes at the international level will first point out that the Special Court of Sierra Leone has been backed and financed by the West (primarily the US, UK, Netherlands, and Canada). For Westerners who are accustomed to impartial judicial systems, this is an irrelevant fact: Justice is justice no matter who is paying for it. To the rest of the world though, there is much greater variation in judicial norms, and the fact that the trial has been funded by Western powers is significant. It will also not escape unnoticed that this trial conveniently helped the US and UK achieve an important geopolitical goal: the removal of Charles Taylor from West African soil at a fragile moment in Liberia’s post-conflict recovery in 2006. In 2003, when the indictment was first announced, Charles Taylor was a major destabilising force in West Africa. Aside from instigating civil war in Liberia and financing the war in neighbouring Sierra Leone, Taylor had also managed to draw Guinea and Cote d’Ivoire into border wars. Removing him from Liberia was the first of many steps towards restoring peace in the country and establishing peaceful relations with neighbouring countries. For the West, it was clear that Taylor had to go and he should not be allowed to return. Indeed, Taylor’s lawyers have pointed to a 2009 US diplomatic cable from former US Ambassador to Liberia Linda Thomas-Greenfield which stated that if the Special Court were to acquit Charles Taylor or even to hand him a light sentence, he would be in a position to jeopardise Liberia’s stability. Thomas-Greenfield states: “The best we can do for Liberia is to see to it that Taylor is put away for a long time.” She goes on to argue that the US should not wait for the Special Court’s verdict and that “all legal options should be studied to ensure that Taylor cannot return to destabilise Liberia”. In all likelihood then, even if Taylor were to be acquitted, it seems likely that the US will be set to charge him with financial crimes. Clearly, the US wants to see Taylor locked up for as long as possible. But the wording of the cable is equally clear that the Special Court’s verdict remains uncertain. While the outcome is far from pre-ordained, it does lead one to worry about how this strength of sentiment from the court’s most important financial backer might indirectly affect the case. Fundamentally though, the core concern is not with judges’ independence. The intensity of public scrutiny and the reputational risks to those who compromise their integrity provide strong incentives for judges to guard their independence. No, the greater worry concerns the choice of cases that international prosecutors decide to pursue in the first place. Turning to the International Criminal Court, a brief look at those who have been indicted reveals that to date, the vast majority have been from sub-Saharan Africa, and the remaining few are from Libya, also on the African continent. While armed conflict has been more prevalent in Africa than in other parts of the world over the past decade, African leaders certainly do not hold a monopoly on the commission of war crimes. Courts build their legitimacy partly based on the cases that they choose to hear. By focussing predominantly on Africans, there is a real worry that the ICC will be perceived by non-Western countries as providing a cloak of legitimacy for the US and other Western nations to achieve their political aims – despite the fact that the ICC’s chief prosecutor Luis Moreno Ocampo has explicitly stated that the ICC is not a court “just for the Third World”. What the international community needs to guard against is allowing the ICC to become a tool that Western liberal democracies can impose on developing country leaders who have fallen out of political favour. For the ICC to remain viable, it also cannot be perceived as the backdoor by which Western powers target their political enemies. All of this takes us back to Charles Taylor. Make no mistake: if he is convicted, few will be sorry to see him locked up. But Taylor’s case does highlight concerns about the political expediency factor and the degree to which it can be exploited. For countries like the US, China, and India who worry about the politicisation of the Office of the Prosecutor, and by extension the politicisation of the ICC, this case will only confirm that their misgivings were justified. For the rest of us though, the conclusion of the Taylor’s trial represents a major milestone in the pursuit of international justice. Dr Christine Cheng is the Boskey Fellow in Politics at Exeter College, University of Oxford. She co-editedCorruption and Post-Conflict Peacebuilding (Routledge) and is currently writing a book about Liberia’s post-conflict transition. She blogs at www.christinescottcheng.wordpress.com. The Iran nuclear issue is moving onto a new phase. Talks have resumed after a break of some two years during which the West tried out coercive diplomacy, including military threats, but failed to stop Iran’s nuclear programme. Both sides are in a chastened mood after peering into the abyss and not liking what they saw. As for the West, the realisation has finally dawned that Iran will not surrender its right to pursue a nuclear programme, while Iran senses that over and above its solemn assurances, it needs to do something extra to convince the West of the peaceful nature of its nuclear programme. Essentially, it becomes a matter of mutual trust. This may sound simple but the journey ahead is difficult not only because it is an untrodden path in the saga of the Nuclear Non-Proliferation Treaty but extraneous ‘non-nuclear’ factors also come into play such as Iran’s rise as a regional power and its integration in the international community, the winds of change sweeping across West Asia, oil, political Islam, Arab-Israeli problem and the Palestine question and, of course, Israel’s security. What complicates all this is the bitter harvest of the United States-Iran standoff through three decades and more and the whirlpool of passions it generated, which refuse to die down and readily play into the highly polarised domestic politics in both countries. The big difference today is that both in Washington and in Tehran, there is willingness to make a serious bid to resolve the problem. Iran’s Supreme Leader Ali Khamenei has put his political and moral authority to affirm the peaceful nature of Iran’s nuclear programme. nd US President Barack Obama has opted to explore the path of negotiations based on a ‘step-bystep’ approach. Indeed, the underlying assumption is that as the perilous journey gets under way, a critical mass of mutual trust would begin to accrue imparting a dynamics to the entire process. There is no surety whether the assumption is right and could be insulated from the predatory strikes of extremists (on both sides), but the international community at least is convinced that this is the road best taken. Clearly, a backdrop of great volatility and danger frames India’s Iran policy in the period ahead. India is a stakeholder in the outcome of the process that formally commenced last Saturday when diplomats from the so-called ‘P5+ 1′ and Iran sat down by the side of the Bosphorous and clocked some 10 hours of conversation and parted with an understanding as to what to talk about when they met again in Baghdad on May 23. Yet India’s ability to influence the ‘outcome’ is virtually zero. The task of diplomacy becomes infinitely tough when it drifts with the tides while securing long- term interests. But there is no point ruing today the policy lapse of the 2005-2006 period, and the huge erosion of India-Iran strategic understanding it caused. What matters most as of now is that India is genuinely undertaking a course correction. The robust efforts to circumvent the roadblock that Washington created over the payment mechanism for India’s trade and economic transactions with Iran; India’s manifest keenness to foster trade and expand its scope even in the current trying circumstances of US sanctions; its political willingness to remain engaged with Iran; India’s adherence to a principled stance on the nuclear issue; and the overall desire to sequester the relationship with Iran from interference from third parties – all these are to be taken note of. The fact that India has vaulted to overtake China to assume the number one spot as Iran’s oil customer in the first quarter of this year – and indeed exceeding its own performance in the corresponding period last year by a whopping 23 percent – underscores the imperatives of the relationship for India’s long-term energy security. likely visit by Prime Minister Manmohan Singh to Iran will be entirely in consonance with this new thinking. The interference of third parties in the Indian-Iranian discourse is nothing new, but the real challenge today lies somewhere else. India needs to factor in that in a conceivable future, the US-Iran standoff may begin to wither away and the two protagonists may resume dealings. Suffice to say, if modern history has been about the control of oil and if the raison d’etre of the Cold War was nothing else, and if the affluent western economies and rising China cannot do without oil imports, Iran’s entry into the global market as a player without handicaps would be a game changer in world politics and international security. Iran is the last frontier in the geopolitics of energy. The countdown may soon begin in the race for Iran’s fabulous energy reserves, and an early start can make all the difference. To be sure, a surge in British diplomacy is already visible in the recent weeks. n sum, the turbulence in the situation around Iran should not be mistaken for an atavistic theatre piece of Sunni-Shi’ite sectarian differences in a competitive contemporary setting. Never forget that Arabs have cohabited with the Persians through one millennium and more. For India, there is no real choice to make between Iran and the GCC states. India needs both, and our diplomacy has its task cut out. Listen to the footfalls of the West and China in the Persian Gulf. Disclaimer: The views expressed in this article are the sole responsibility of the author and do not necessarily reflect those of the SPY EYES Analysis and or its affiliates. The contents of this article are of sole responsibility of the author(s). SPY EYES Analysis and or its affiliates will not be responsible or liable for any inaccurate or incorrect statements and or information contained in this article. United States Secretary of State Hillary Rodham Clinton has threatenedsanctions against Pakistan if Pakistan would continue progress on Pak-Iran gas pipeline project. While giving statement in front of Congress Hillary Clinton said that the being mounted against Iran by imposing sanctions and siege is being tightened against Tehran. She said that Pakistan is continuing talks regarding the gas pipeline project, adding that if Pakistan will not stop progress on the project than the US would impose sanctions on Pakistan, which would result in further harm to its weak economic situation. Memos that are scheduled to be released on Thursday reveal that Pakistan was lying about its nuclear program in the 1980s, and was in fact seeking nuclear weapons. The US halted assistance to Pakistan in 1990 after concluding that the country was developing nuclear weapons. US officials concluded in the 1980s that Pakistan was lying about its nuclear program but muted criticism due to Islamabad's support against the Soviets in Afghanistan, declassified documents showed. The memos to be released Thursday reveal some of the behind-the-scenes drama between the United States and Pakistan during Ronald Reagan's presidency, foreshadowing current-day debates in the uneasy war partnership. The documents included an account of a secret mission in June 1982 by a US envoy who confronted Pakistani military ruler Mohammed Zia ul-Haq with a letter from Reagan and said the United States had "incontrovertible" proof that Pakistan was seeking nuclear weapons. The emissary, veteran US diplomat and translator Vernon Walters, said that Zia was "extraordinarily courteous, relaxed" and explained that he had no knowledge of nuclear weapons development but would check with his subordinates. "Either he really does not know or is the most superb and patriotic liar I have ever met," Walters wrote to the State Department. The documents, some obtained after requests under the US Freedom of Information Act, were released to the National Security Archive at George Washington University, which made them available to AFP in advance. Pakistan tested an atomic bomb in 1998 days after its arch-rival India. The United States banned assistance to Pakistan in 1990 -- soon after the Soviets left Afghanistan -- after concluding that it was developing nuclear weapons. But Reagan exempted Pakistan from a law requiring sanctions, named after then senator Larry Pressler, even though the memos said that officials knew that the country was moving toward nuclear weapons. The documents showed that the Reagan administration was genuinely concerned about Pakistan's nuclear program, fearing it would trigger instability, and repeatedly warned Zia that Congress could cut off assistance. "There is overwhelming evidence that Zia has been breaking his assurances to us. We are absolutely confident that our intelligence is genuine and accurate," then secretary of state George Shultz wrote in a November 1982 memo to Reagan. But Shultz recalled the "essential role" played by Zia in Afghanistan, where US and Pakistani agents funneled weapons to Islamic guerrillas who successfully fought a Soviet invasion. "A rupture of our relationship would call into question a central tenet of this administration's foreign policy -- strong support for our friends," Shultz wrote, calling the Afghan effort "the most visible evidence of the US commitment to counter Soviet military thrusts worldwide." The memos said that as far back as 1982, US intelligence detected that Pakistani agents were seeking suspicious items from countries including Belgium, Finland, Japan, Sweden and Turkey. Years later, such efforts were discovered to be the work of scientist Abdul Qadeer Khan, the father of Pakistan's nuclear bomb. He is also accused of running a vast international black market of nuclear goods. One secret assessment said that Pakistan was already believed to have enough for one nuclear weapon by October 1985 with assistance from China. The US memos acknowledged that Pakistan was unlikely to comply with US pleas on its nuclear program in light of its concern over India, with which Pakistan has fought three full-fledged wars since independence in 1947. The documents said that the United States was also urging "restraint" from India, which had strained relations with Washington during the 1980s. Despite the criticism of its nuclear program, the United States resumed assistance to Pakistan to the tune of nearly $20 billion after it again offered support in Afghanistan following the September 11, 2001 attacks. But relations have repeatedly plunged into crisis due to the presence of Osama bin Laden and other militants on Pakistani soil and Islamabad's fears that US ties will again sour once troops leave Afghanistan in 2014. Pakistan Prime Minister Yousuf Raza Gilani was today convicted by the Supreme Court for contempt over his refusal to revive graft cases against President Asif Ali Zardari and was given a symbolic sentence that lasted 30 seconds threatening his continuance in office. “For reasons to be recorded later, the prime minister is found guilty of contempt for willfully flouting the direction of the Supreme Court,” Justice Nasirul Mulk, who headed the seven-judge Bench said as he sentenced Gilani “till the rising of the court”, sparing him a jail term. The court also made a reference to Article 63(1g) of the Constitution, which lists the grounds for disqualifications of a convicted parliamentarian, but did not invoke it. “We note that our findings and the conviction for the contempt of court recorded are likely to entail some serious consequences in terms of Article 63(1g) of the Constitution,” the Bench said in a short order. Experts said this left the door open for the initiation of the process for the disqualification of 56-year-old Gilani, Pakistan’s longest serving Prime Minister. However, the Speaker of the National Assembly or lower house of Parliament will have 30 days to decide on such a move and the Election Commission a further 90 days – effectively meaning that the premier can remain in office for four more months. The entire proceedings in the courtroom number 4 lasted less than 10 minutes. The judges left the court immediately after announcing the verdict, effectively ending Gilani’s sentence. Emerging from the heavily guarded court, Gilani told the media: “We had sought justice. The decision was not appropriate”. A visibly dejected Prime Minister, accompanied by his sons, shook hands with his team and members of the federal cabinet after hearing the verdict. Attorney General Irfan Qadir described the verdict as “unconstitutional and unlawful”. The premier remained standing for 30 seconds after the announcement of the judgement. Opposition leaders, including PML-N chief Nawaz Sharif and Pakistan Tehrik-e-Insaf chief Imran Khan, called on Gilani to resign following his conviction. “In light of the verdict, I think Prime Minister Gilani should resign immediately rather than prolong the issue,” Sharif said. The PML-N would no longer accept Gilani as the premier and the government was “on a wrong wicket” while the Supreme Court is “on high moral ground and people should back the truth”, Sharif said. He also demanded the holding of fresh elections and the installation of a caretaker government. Earlier in the morning, Gilani drove in a small motorcade to the Supreme Court complex, where members of his council of ministers were waiting for him. The premier walked towards the building flanked by his son Abdul Qadeer Gilani and Interior Minister Rehman Malik as his supporters showered rose petals on him. Gilani, clad in a black sherwani, stopped at the door of the building and waved to his supporters before going inside. After the judges entered, Gilani walked up to a rostrum at the centre of the courtroom with Law Minister Farooq Naek and his lawyer Aitzaz Ahsan. Gilani had been facing the prospect of a prison term of up to six months but his actual sentence lasted 30 seconds. The Supreme Court has been pushing the government to reopen cases of money laundering against President Zardari in Switzerland since December 2009, when it struck down a graft amnesty issued by former military ruler Pervez Musharraf. The government has refused to act, saying the President enjoys immunity in Pakistan and abroad. The government put in place strict security arrangements for Gilani’s third appearance in the Supreme Court for the contempt case. PESHAWAR: The Khyber-Pakhtunkhwa government has asked Afghan immigrants living illegally in Peshawar to leave within a month, Peshawar DCO Siraj Ahmed Khan has said. He said that currently, the deadline is only applicable to the provincial capital but after the deportation of illegal immigrants from the city, it will be extended to other parts of the province. Khan said that committees were operating on a micro level in Peshawar to collect data about illegal Afghan immigrants and will be able to evacuate them after one month. The letter by India’s Army chief last month blasting the state of the armed forces reflected a troubling reality – India’s regional military power aspirations are in danger. Last month, India’s Parliament was up in arms over the leak of a supposedly top secret letter written by Army Chief Gen. V.K. Singh to Prime Minister Manmohan Singh. In typical Indian fashion, the uproar – partly spontaneous, partly orchestrated – was at first more about the leak of a highly confidential letter than the critical shortages of weapons and equipment that were pointed to. After the initial din died down, however, the import of the Army Chief’s letter gradually dawned on lawmakers asked the government and the Army to explain why the shortages haven’t been addressed. Indeed, the shortages are all the more baffling because India’s Defense Ministry reported it had spent its full quota of funds in each of the last three financial years, while the Stockholm-based International Peace Research Institute (SIPRI) said recently that between 2006 and 2010, India ranked first in terms of arms imports. So why all these shortfalls? The answer lies in the convoluted and often excruciatingly slow acquisition process that exists within the Defense Ministry. By even some conservative estimates, it can take anywhere between three and five years for a proposal mooted by a service headquarters to come to fruition. This snail’s pace has been noted by lawmakers in the past. In his first interview on assuming office on April 1, 2010, Singh told me bluntly: “Our biggest challenge is how to remove our hollowness in terms of deficiencies in various fields, and the second one is modernization. Both need to be addressed (as a) priority so that whatever the Army requires that makes it battle worthy is there. “When I talk of ‘hollowness,’ it is when you authorize something, but it may not be there because over a period of time, the procurement (process has) delayed acquisition,” he said, adding that such delays inevitably mean that some of the equipment is obsolete by the time it is available for combat units. Two years on, and it’s clear that despite the voicing of such concerns, even the day-to-day requirements of many combat units are at dangerously low levels. Singh wrote first to Defense Minister A.K. Antony and then to the prime minister to highlight this fact. One of the key reasons for the military shortfalls has simply been the duplication of effort in processing a procurement proposal at both the Service Headquarters and the Defense Ministry, since the two aren’t integrated at the functional level. As a result, files are typically initiated and processed at the service headquarters before undergoing the same process at the ministry. In addition, the generalist bureaucrats at the ministry are often unable to grasp the urgency of the armed forces’ requirements, frequently sitting on files for months on end. The civil servants, for their part, say the military keeps changing qualitative requirements, leading to delays. And so the blame game goes on, leaving soldiers without basic requirement. The solution, analysts say, is to truly integrate the bureaucracy and the service headquarters through cross postings and by creating specialists with domain knowledge across the spectrum. Unfortunately, this is all easier said than done. One barrier is the high level of mistrust between armed forces representatives and the civilian bureaucracy, a state of affairs that has existed since India secured independence in 1947. Despite the change in nomenclature, with the service headquarters now known as the Integrated Head Quarters, the processes haven’t really changed. But this was back in 2008-09, and it’s apparent that little has changed. Reading between the lines, though, there’s a simple message: give more financial power to service chiefs. As things stood, acquisitions of up to Rs 50 crore ($9 million) could be cleared by the chiefs and vice chiefs, while the defense secretary has had the authority to approve deals up to Rs 75 crore. India’s annual defense outlays of about $40 billion may pale in comparison with China’s official $100 billion-plus, but defense majors from across the globe have been flocking here trying to sell their wares. The problem has been that most big deals in the finalization stage, or even those that have been finalized, have become stuck in the final stages in part because Antony is ultra cautious in trying to reassure over the legitimacy of the acquisition process. This committee has also moved to fast track efforts to provide equipment to India’s Special Forces, including advanced assault rifles, all-terrain multi-utility vehicles, GPS navigation systems and underwater vehicles. This comes on top of a range of items that have been cleared for immediate purchase, including two regiments worth of Pinaka multi-barrel rocket launchers, 10,000 Konkurs-M anti-tank guided missiles and 145 M-777 ultra-light howitzers, which cost $647 million and will come from the United States, theTimes of India reported last week. Politically, at a time when the country has been wracked by one corruption scandal after another, Antony’s caution over the acquisition process has been understandable. But the upshot is that the military is consistently faced with delays and shortages of critical arms and ammunition. It’s this reality that makes a mockery of India’s aspirations of becoming an effective regional military power.